When you travel, do you enjoy sprinkling a little education into your entertainment? If so, the Kennedy Space Center is the perfect Florida destination for you. The Space Center is the perfect blend of learning in a fun environment. My kids knew we were there to learn about space travel, but we had so much fun playing that we felt like we were at an amusement park. Plan to spend at least 6-8 hours at the Kennedy Space Center. We stayed 7 hours and felt rushed at the end because we had a long drive ahead of us and needed to leave to get on the road. Plan to spend the day so you don’t miss anything. The space center reminded me of Future World at Epcot with plenty of buildings, exhibits, and things to do to entertain the whole family for many hours. I will admit that I was a little wary of the $50 ticket price for adults, but I was pleasantly surprised to find that all the main exhibits, tours, IMAX movies, bus tour and more are included in the ticket price. 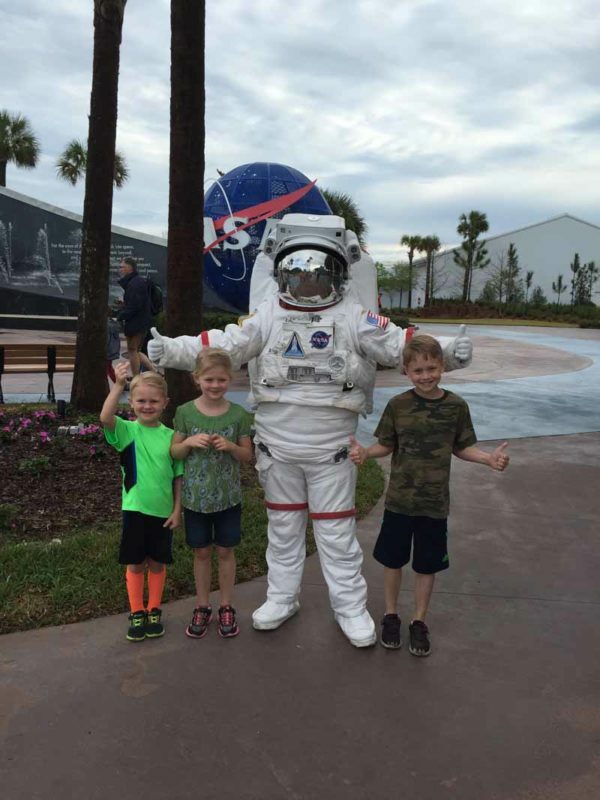 There are ticket upgrade options you can purchase, such as lunch with an astronaut, but I felt like we got a complete experience with the basic ticket and it was nice to have it all included. I feel like we definitely got our money’s worth here. We loved the Atlantis exhibit. The first part is a guided, walk-through video tour that tells the story of Atlantis, and then you enter a hands-on exhibit where you can see the space shuttle Atlantis and play with dozens of interactive exhibits to help you feel what it would be like to be an astronaut. My kids loved the hands-on exhibits and I had to drag them out when it was time to go. At the end of the Atlantis exhibit, don’t miss the Shuttle Launch Experience. This is the only “ride” at the space center, and we loved it. Kids must be 44 inches tall to ride. They give you enough safety warnings to scare people away, but my tall four-year-old loved this ride and wasn’t scared at all. The family selfie before we blasted off to space at the Shuttle Launch Experience. My kids were sad that I pulled them away from the hands-on activities at Atlantis to get on a bus tour, and a few of them were grumpy for the first part of the bus ride. But the tour guide, video tour, and looking for alligators as we drove soon distracted them and we enjoyed the bus tour. The bus ride is 40 minutes, and you will see the Apollo 8 launch pad and learn many the details about the NASA space program and launch sites. The bus stops at the Saturn/Apollo V center where you can view the massive 363-foot-long Saturn moon rocket. My kids all loved touching a moon rock at the Saturn/Apollo V center. Plan on 1.5 to 2.5 hours for the bus tour, depending on how long you stay at the exhibits. There is a cafe in the Saturn/Apollo V center in case you are there over lunch time. Buses run continually to take you back to the Kennedy Space Center, which is a direct 10-minute ride. The bus tour will be the highlight for someone who wants to experience the history of NASA and the space program, but my younger kids would probably tell you this was their least favorite part of the day. When the bus tour and Atlantis exhibit get busy, the rocket garden is a great place to explore. Kids can climb in many replicas and pretend to be astronauts, while you read about each of the many rockets in the garden. It was hot on a sunny afternoon in the rocket garden, but I’ll bet this part of the space center is beautiful at night. There are many other smaller exhibits, buildings, play areas, cafes, and restaurants to explore as you enjoy your day at the space center. Be sure to take in at least one of the two IMAX movies that are included with your ticket price. We saw Journey to Space in the afternoon and loved the chance to sit down, cool off, and learn more about space travel. Arrive early. I cannot stress this enough, but this is my #1 tip for any amusement park, and it holds true for the Kennedy Space Center as well. Arrive 15-20 minutes before the 9:00 a.m. opening so you can park, get in line, and be there when the gates open. We arrived at 8:30, got a great parking space, and were able to take plenty of pictures before we started. We caught a photo op with an astronaut with no lines. When the gate opened, we nearly had the place to ourselves. We there over spring break so it got very crowded as the day wore on, but that first hour we enjoyed so much without waiting in any lines. Book tickets online. You can save time at the gate if you book your tickets online in advance. Many hotels in the area also sell advance tickets if you want to buy them at your hotel. Seniors, military, and educators may be eligible for a small discount on admission. Start at Atlantis. I asked several different employees what their best strategy tips were to enjoy the Kennedy Space Center with the least crowds. Everyone suggested that we make sure to get on the 10:00 a.m. bus to the launch site. So we headed straight to Atlantis at 9:00 a.m. as soon as it opened and spent one hour doing the Atlantis tour. You really need two hours to do the Atlantis building, but after all the warnings about long lines, we left after one hour to do the shuttle bus tour of the launch sites and returned to the Atlantis building after lunch. Do the Kennedy Space Center Bus Tour in the morning. Arrive as close to 10:00 a.m. as possible. We didn’t wait in line at all, but later in the day the lines were lengthy to board the tour bus. Make sure kids use the restroom before since the initial bus ride is about 40 minutes long and there are no restrooms on the bus. As you enter the bus, you will have the best views if you sit on the left hand side of the bus as you walk on (right hand side once you are seated). Bring food and snacks into the Kennedy Space Center. I didn’t know if I could bring food, so I left everything in the car. My kids were starving by the time we finished our bus tour and I wished I had packed granola bars and snacks. You can bring a soft-sided cooler into the Kennedy Space Center. (This cooler bag is my favorite road trip purchase and saves us hundreds of dollars in fast food when we are on the road.) Since we had a great parking space, I ran back out to the car and brought our lunch inside. There are plenty of cafes and a variety of food options at the space center for those who want to purchase lunch. The Kennedy Space Center is a great place to stop before or after a cruise out of Port Canaveral. There are plenty of hotels nearby that offer discounted or free cruise parking, and you can add a stop at the space center to extend your fun. The space center is a one-hour drive from Orlando. Disclosure: I received two complimentary tickets to the Kennedy Space Center for the purpose of review. I happily paid for my children to visit with me. All opinions are my own. I am not a mom at all 😉 but still the tips are sooo elaborate and useful! Thank u so much! I am so curious to ask u so I ll go ahead. How do you have NASA pay u for visiting them? Hi Cheree. Thanks for your comment! Many attractions provide courtesy admission to members of the media. They typically have information about their policies and requirements on their official press page. Thank you so much for the information! I’m contimplating on not doing the bus tour because my kids would probably be bored and are very hands on. I will be going this weekend and your information has made my planning so much easier and not to mention the option to take snacks inside! Thank you again!!! Thank you! Have a wonderful trip! !